Be the first to share your favorite memory, photo or story of Lathea. This memorial page is dedicated for family, friends and future generations to celebrate the life of their loved one. 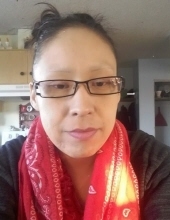 It is with heart-filled sadness that the North Peigan/Cross Child families announce the sudden passing of LATHEA NORTH PEIGAN/CROSS CHILD on Saturday, March 30, 2019 on the Piikani Nation in Brocket, Alberta. A Prayer Service will be held at Snodgrass Funeral Home on Sunday, April 7, 2019, at 1:30 pm, followed by a one-day Wake at Lucille North Peigan’s home at 2:00 pm. On Monday, April 8, 2019, a one-day Wake Service will be held at Ivy & Raymond Cross Child’s home. The Funeral Service will be held on Tuesday, April 9, 2019, at 11:00 am at the Piikani Community Hall, followed by burial at the Brocket cemetery. Snodgrass Funeral Home assisting the North Peigan/Cross Child families with arrangements, (403) 627-4864. To send flowers or a remembrance gift to the family of Lathea Rose Mary North Peigan (Pincher Creek), please visit our Tribute Store. Followed by one-day wake at Lucille North Peigan home. On Monday, April 8, a one-day Wake to be held at Ivy & Raymond Sr. Cross Child's home. "Email Address" would like to share the life celebration of Lathea Rose Mary North Peigan (Pincher Creek). Click on the "link" to go to share a favorite memory or leave a condolence message for the family.